So I rented an excavator this time around, and my dad came out to play in the dirt with me. 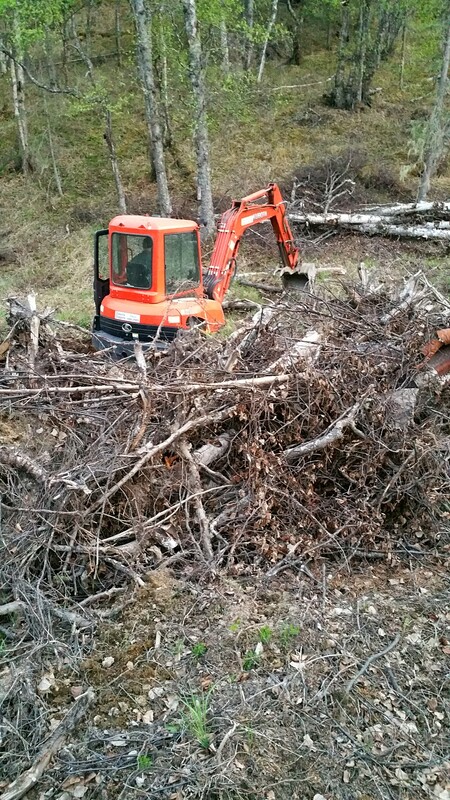 He took out some more trees, took out some of the hill in the driveway, moved a bunch of gravel into a mud hole, and buried some tree stumps. His handiwork is most excellent! The ground work is nearly done. I really should rent another piece of equipment before the ground freezes, but my dad threw his back out pretty bad… and I expect that he won’t be up for manual labor before the snow falls. He swears that this is more like playing than working! One of the things that I love about the property is how much sun it gets, and now that 30 or more trees have been removed, it really does get a lot of sun. So much so that I was forced to flee the heat down to the cooler section by the outhouse. Yes… in Alaska, it got so hot that I was forced to flee the heat, and coworkers asked me if I had been to Hawaii when I returned to work. 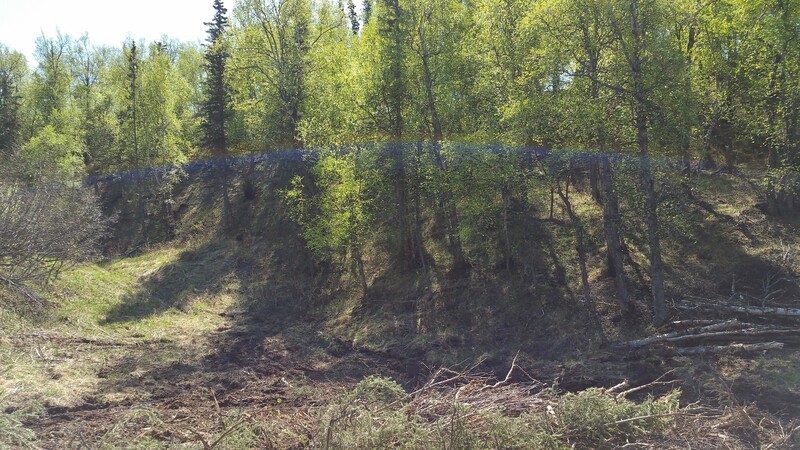 There’s this neat little hollow just below where I want to build the cabin. Over this last winter, a gigantic pine tree fell over. My dad cut it up, dug up the stump, and then buried the stump. During this process, he discovered that the hollow is nothing but topsoil at mud at least 10 feet down. There’s nothing solid for the gentle continuation of the driveway that I desire. So for now, we use the very steep and solid driveway. Gaze upon the conspicuously absent pine stump! Even my camera couldn’t handle the intensity of the sun that weekend, but I’ll look back on these pictures on snowy winter days and be glad for the out of control lens flaring! 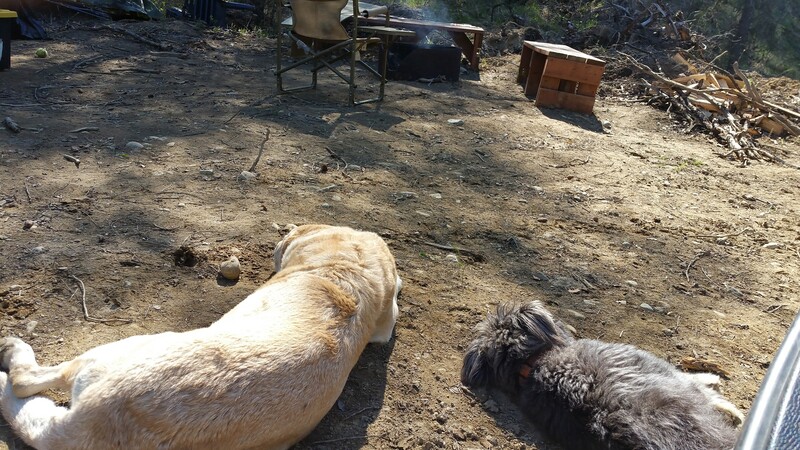 The puppies baked in the sun and purposefully laid in the muddier spots to stay cool. There wasn’t much shade for them, but they eventually moved under the benches once the sun got serious. The property looks so different from how it did a couple years ago. There is plenty of room for my boyfriend and me to pitch a tent, my parents can drive their trailer up, and my brother has room to pitch a tent, too. We spent a lot of time at the property this summer, and I will need a month of updating the blog to get all caught up with where we are today… which is at home, under a quilt made my lovely Aunt Alice, enjoying a rare and exceptionally nice day off from both jobs. This entry was posted in All, Cabin and tagged alaska, build a cabin, cabin building, camping, DIY cabin, dream cabin, heavy equipment, off-the-grid, tiny cabin, tree stump. Bookmark the permalink. 1 Response to More Playing in the Dirt! I enjoyed having lunch at your property this summer, and you do have the nicest outhouse I have ever used . Love you.